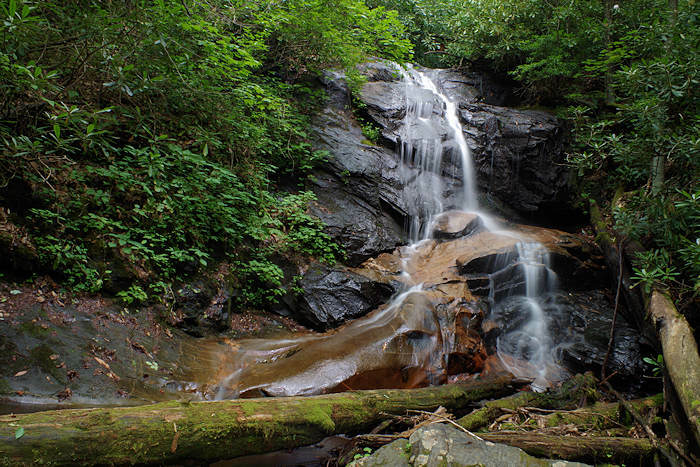 Log Hollow Falls is a 25-ft. waterfall in the Pisgah National Forest. While it's an easy one-mile round-trip hike to reach, it's still a hidden jewel that many waterfall-lovers miss. 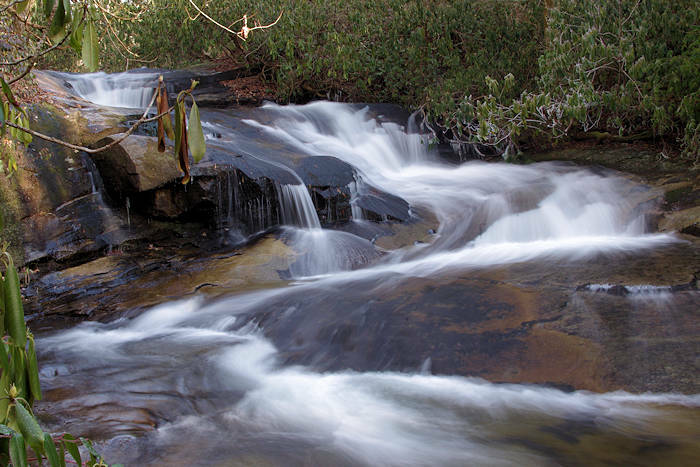 Plus, there's a second unnamed 80-ft. waterfall about a quarter-mile past Log Hollow (we named it Kissing Falls). Like many waterfalls in the North Carolina mountains, there are no signs at all, so you need to take along exact directions. The hike is easy since you follow Forest Service Road 5043 that is closed to vehicles. This waterfall gets many fewer guests than it's popular neighbor, Looking Glass Falls, since it's located off a one-lane unpaved road. So, it's a great waterfall to often have all by yourself. In late July and early August, enjoy plenty of wild blackberries along the trail! 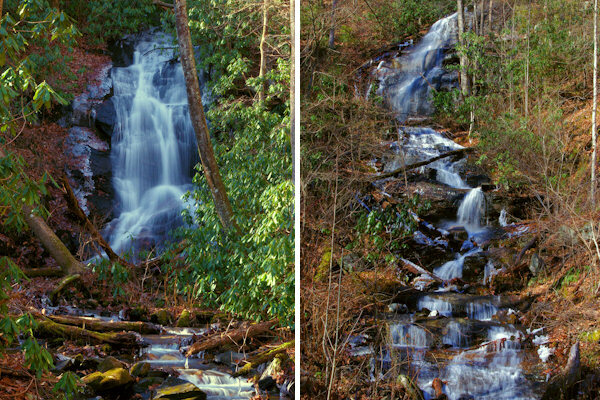 Log Hollow Falls (left) and "Kissing Falls" (right) in the winter after plenty of rain. Walk around the gate (trail sign says "To Senaird Ridge") and down the old logging road about a half-mile to the second bridge and look right for Log Hollow Falls. A short path just past the bridge leads up the creek to the base of the falls. It's a mostly level hike. Continue another 1/4-mile to the second, taller waterfall (Kissing Falls) that cascades right to the road! We visited in the winter when the views are best since there are no leaves on the trees. When leaves are out, the second waterfall is hidden a bit. The road is often closed in January-March. (About 40 miles) Take I-240 West / I-26 East. Continue on I-26 East to Exit 40 for Highway 280 (and the Asheville Airport). Take a right onto Highway 280 West and go 16 miles toward Brevard. As you enter the Brevard area, you will see a big shopping center on the right (with Wal-Mart). Just past the center, turn right onto US Highway 276 North (Forest Heritage Scenic Byway) to enter the Pisgah National Forest. Go 10.5 miles. Turn left on FR 475B. Go about 1.6 miles to a sharp turn to the left (look for a big Forest Service Management interpretive sign) and park by (not in front of) the gated Forest Service Road 5043 on the right. At Milepost 412, take US 276 South for 4.6 miles to unpaved FR 475B on the right. Turn right and go about 1.6 miles to a sharp turn to the left (look for a big Forest Service sign) and park by the gated Forest Service Road 5043 on the right. Continue down FR 475B four miles to Slick Rock Falls. 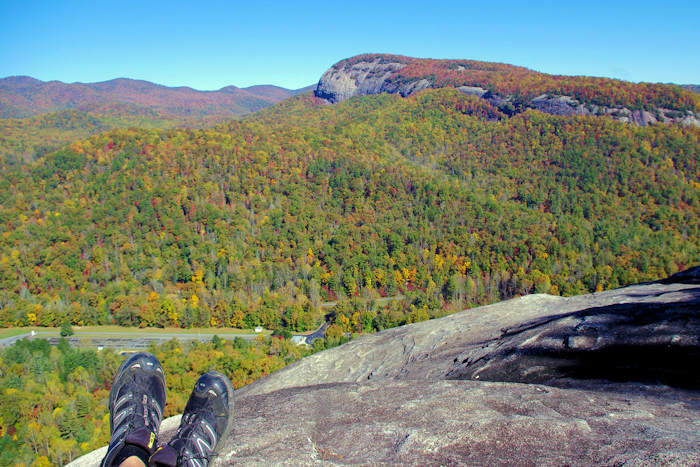 Also in that area are Cove Creek Falls, Daniel Ridge Falls, Looking Glass Rock and John Rock. 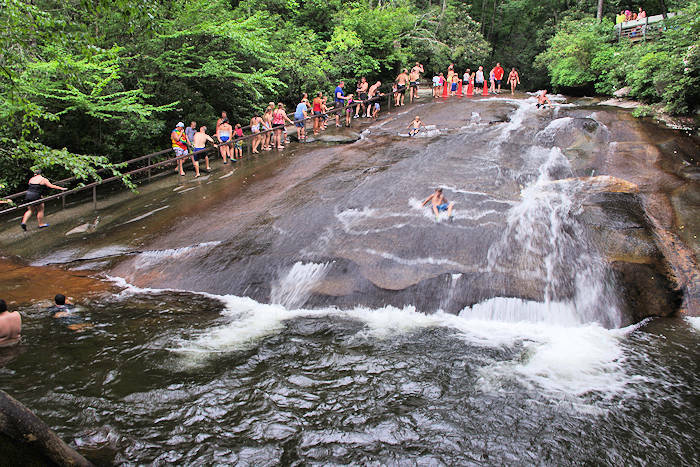 Also, a few miles away (on US 276) are Looking Glass Falls and Sliding Rock. It's about 12 miles from the Blue Ridge Parkway. Also, see our Pisgah Forest Waterfall & Hiking Map.